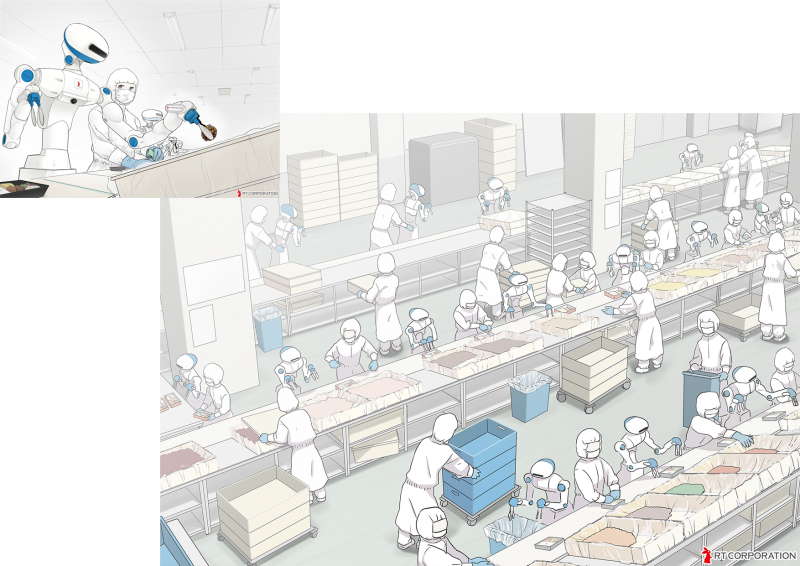 We developed a prototype of a collaborative person type service robot that can safely do the work of arranging a box lunch dish which is said to be difficult to automate by a robot safely next to the person. 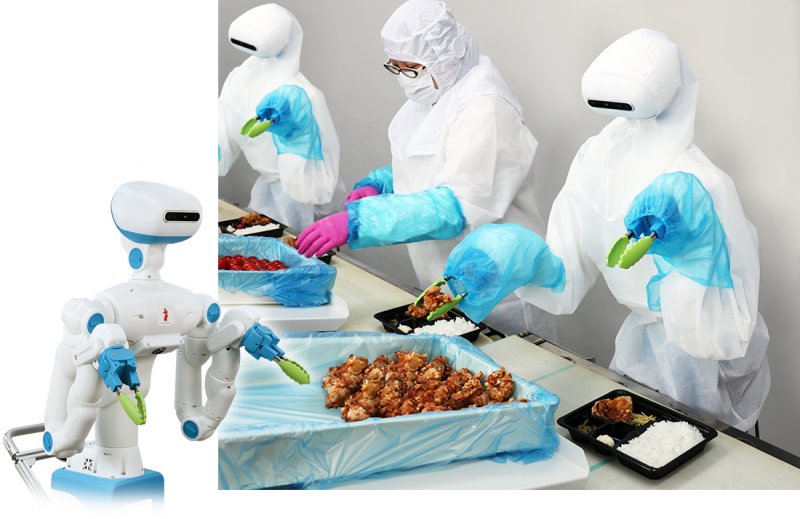 This upper body type robot can work on a belt conveyor line at a lunch box and is a cooperating person type service robot of 130 to 150 cm regarding the size of the small adult human nature. This robot is based on Sciurus 17, a top-ranking service robot developed and sold for the university and research institutions, and it identifies side dishes of bulky amorphous lunch box with the camera of the head , The arm section has the function of taking out one of them and placing it on a lunch box (patent pending). A collaborative service robot developed by RT Corporation is equipped with “eyes” to distinguish ingredients by deep learning. Recognizing that the foodstuffs piled up in the food container are aggregates of small individuals, take out one of them from the mountain of foods and serve it in a box lunch. Moreover, it is possible to recognize even individuals with rough shapes different from each other like fried. 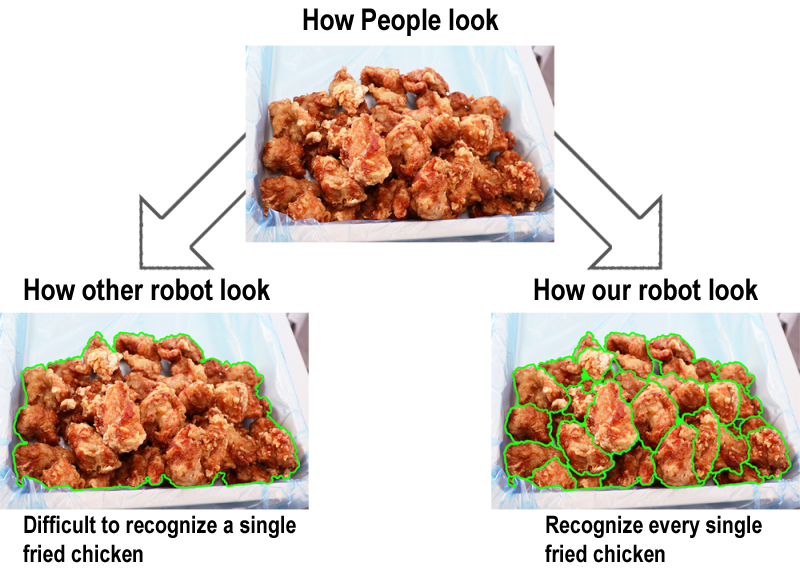 This function is the first technology in the food industry (*), realized by deep learning (deep learning) utilizing Google’s framework TensorFlow (patent pending). You can work safely and comfortably. Design that does not feel uncomfortable even next to a person. Our collaborative-type robot is developing on the premise that people work next to each other. Height 130 to 150 cm, shoulder width 39 cm, in addition to a small adult woman, to reduce shock even if it hits a person, we incorporate hybrid control of torque and position in each motor part. Furthermore, we designed the robot not to pinch human’s hands and arms, and we have incorporated a lot of human-friendly measures. Recently, a variety of menus for lunchboxes are made with various types of small quantity production according to customer’s needs. At lunch boxes you have to make 3 or 4 types per hour in the same line, you must change the side dishes, the arrangement order, the arrangement position, etc. every time. Based on the facts of such a site, we adopt casters at the bottom so that we can quickly move the robot. In addition to AC 100 V power supply, power can be equipped with a rechargeable battery that can work for a long time.